Acoustic Travel Guitar.Take your guitar along anywhere you go! It seems like acoustic travel guitar choices are few and ones that sound good are fewer. Your choice of a travel guitar, most people choose small acoustic guitars, can bring fun, excitement and entertainment to what would otherwise be a dull vacation or trip. To make the most of a trip, you need a guitar that sounds good. Find a acoustic travel guitar that sounds right for you. The problem is that quite a few of the guitars available in a acoustic travel guitar category are small acoustic guitars that sound more like a cheap ukulele than a decent guitar. Another challenge is to find an acoustic travel guitar that can handle the stress of travel. Does a travel guitar have to be a small guitar? It all depends on the situation. Some people opt for an Electric travel guitar and a portable guitar amp. Sometimes if you have the room to bring it, all you need is a full-size guitar durable enough to handle the trip and that opens up many more choices. Most of the time, a person would not want to bring their expensive guitar on a road trip. That's the problem with expensive guitars, people can be intimidated by the thought of hurting them and that discourages whooping it out at a time of sudden inspiration. Here're 4 things to look for in a travel guitar. Durability - No guitar is indestructible, care should be taken with any guitar. Some guitars can handle changes in temperature and humidity better than others. Always follow your guitars manufacturer's guidelines for care. Travel guitars can be subjected to extremes of heat, moisture and the rigors of travel.The proper choice of materials used to build the guitar, protective cases and knowing how to care for your guitar on the trip, can save you from a expensive trip to the repair shop or the loss of your guitar. Portability - This depends on how you are traveling. Traveling on airplanes, trains and buses can call for a small guitar easily stowed wherever they permit it to be stored. If you are backpacking it probably bests that it's small and lightweight. If you are making a road trip in the car and you have room for it, a durable full-size guitar will give you the best sound possible. Sound quality - It needs to sound as good as possible. This comes from material choice, design, and craftsmanship. No small travel guitar is going to sound like a full-size guitar, of course, but there are some really amazing sounding travel guitars made by very good companies at very reasonable prices. Playability - Is it easy to play? In order to cut down on the size and weight, there are some very odd shaped travel guitars available. It can be a challenge to even hold them correctly.But it's mostly just the backpacking guitars that really are a challenge and with a strap they really are not that bad. A full-size guitar made with materials that can better withstand changes in changes in humidity and heat better than a regular solid wood guitar will give you the most volume and the best sound. Here are some that I think are outstanding. Martin X series with full body HPL for amazing durability and sound - The sound of a full-size quality Martin guitar at a price that is way less than solid wood models. Rainsong graphite guitars - These a really unique guitars. They sound like a really great guitar because they are. Talk about durability! These things are designed to take it. Here is a link to their website. I was very impressed. Ovation Adamas guitars - A very reliable, great sounding guitar with a graphite fiber top. Buy an inexpensive, quality full-size guitar and be careful with it. Take care of it - but if someone drops a watermelon on it, just buy another, at least it wasn't your $3000 Martin. There is a difference between super cheap and an inexpensive quality built guitar. I believe the Epiphone line in the $200 to $300 range is a great buy or a Yamaha acoustic guitar in that same price range is remarkable sounding. Solid spruce tops for sound quality and Laminates for the sides and back. This would make a great combination of durability and tone. They are a great buy for the money. A proper set up by a guitar tech and they are great sounding inexpensive guitars. A small travel guitar that can be stowed if traveling on an airplane, bus or train (subject to airline rules, of course). The Martin Little Martin - built from HPL (high-pressure wood fiber laminate), they are tough, sound good and are a great choice for a travel guitar. Their necks are made from strata bond wood laminate which makes a very stable and durable neck. These little guitars sound great for their size and are very durable. They took a little Martin to the top of Mt Everest and it played great. I don't think they took their gloves off for long to try it out, though. Taylor - Baby Taylor. - Amazing sound from a small guitar. Made with a solid spruce top with x bracing and Sapele arched back and sides. This little guitar should hold up well. For one reason it is a Taylor, they are very well thought out, intelligently designed guitars. The sides and back are made of High-quality laminate which holds up to temperature changes and humidity well. Be careful about the solid wood top, though. Treat any guitar with care. They are supposed to last a lifetime. Washburn B52SW - If you are very careful about your guitar there is the Washburn B52SW solid wood travel guitar. Solid wood guitars are more vulnerable to temperature and humidity changes. Be careful. Washburn Rover - A good sounding guitar for its size. Reasonably priced. Comes with a case. Remember even a small acoustic travel guitar should be inspected and set up by a competent guitar tech for best play-ability and sound. A backpack guitar. Backpack acoustic guitars are as small as a travel guitar gets.It is really an accomplishment to get a decent sound out of something this small and you have to really appreciate them for what they are. 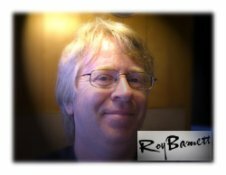 Make sure you check out these related web pages that go along with acoustic travel guitar choices on this site. 1. Portable guitar amps - This is how you get big sound from a small guitar. 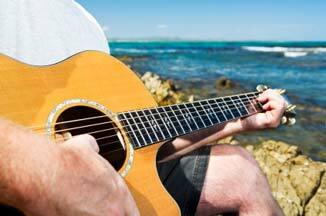 2.Acoustic guitar tuning - Easy ways to sound great. 3. Guitar finger exercises - How much difference can strong hands and fingers make? Fun exercises to make you super human. Take care of your acoustic travel guitar and it will provide you with years of enjoyment. Have a great trip and watch out for the kid with the watermelon.